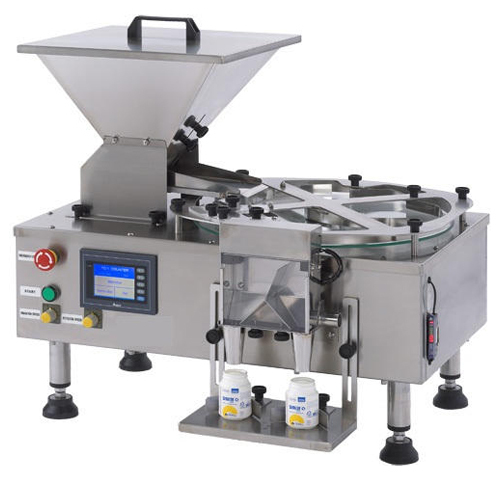 The PL-7 is a high speed and efficient batch counter, designed and developed to count all shapes of products accurately like capsules, tablets and pills. Stainless cabinet, fiberglass hopper, and glass turntable meet G.M.P.requirements. Batch range counts from 1 to 9,999 pcs. All parts are easy to exchange, including PC boards of countrol system. Collector of chips and powder is provided. Well design structure,easy to maintain and clean. No additional change part required in various product sizes. Dust compensator and sensor sensitivity automatically self-adjusts to offset the gradual accumulation of powder on the sensor window. All product contacts are made of stainless steel 316 or FDA approved material. : Capsule #1 50,000 pcs/hr. : Capsule #4 70,000 pcs/hr.